I realize that this is an older disc, released in 1990. However, with the reunion of this powerful lineup for this year's tour, I had to say something about them. I've had the opportunity to meet these guys and I have to say that they are one of the friendliest bands to ever meet. 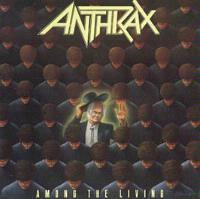 This album was one of heaviest to date for Anthrax. Major distortion, major crunch, and Joey's vocals make this a combination that any true metal collector should have in their collection. Musically this starts kind of slow for them - very methodical, then pow!. Before the first verse you need a neck brace. This has a great guitar crunch, that truly IS Anthrax. Lyrically, this song was done during their "Let's write songs about what WE like" phase. This song is about the Stephen King novel, "The Stand". It's a shame they never used this during the movie. With lines like, "I'm the walking dude, I can see all the world, twist your minds with fear. I'm the man with the power." This is a classic track. Here's another track that will make your neck numb. This is a musical onslaught from the word go. Lyrically this has some of my personal favorite lines in it. "Talking to you is like clapping with one hand." Hey, it's the comedian in me, I can't help it. This one drives the entire way through it, so brace yourself. This is another classic track that they played live for quite a few years to follow. Lyrically this one showcased one of Scott Ian's heroes: Judge Dredd. "Respect the badge, he earned it with his blood." Here's another true classic, and another personal favorite for obvious reasons. This track is about a comedian (ahem), who ends up dying before his time. If you have difficulty deciphering the title, let me give you a hint. Read it backwards. Musically there couldn't be a more tight song. The guitar shreds through this like a samurai. A complete drive from start to finish, the guitar will keep crunching through this fast paced neck snap fest. Lyrically this is about an ex nazi, "He was once SS." Imagine the secrets that someone like that would have. Hmmmmmmmmm. Joey pays homage to his heritage in this wild track. Musically this cut is breathtaking. I love the change of rhythms during this one. Lyrically I love the sentiment that Joey is putting forward during this. And you have to love Scott's cry of "War Dance" just before the bridge. This is one of the lesser known tracks on this disc. I happen to love the guitar to this one. It goes hard from the get go, then becomes more methodical and even paced for Joey's vocals. This is a must hear track. This starts off with an acoustic piece. Yes, I said acoustic. Once it winds down, get ready for your teeth to get kicked in. This is one of the few songs that seem to take forever before you hear any vocals. However, the musical parts to this complex track are worth every second. This final track is the true Mosh Pit experience. The way the guitar sounds like it's being worked, you can almost picture the pit forming right in your own mind's eye. Listen, enjoy, and go see them live during the reunion this year. It's gonna be worth it!